This chart shows the TOTAL rainfall accumulation for England and Wales over the next 24 hours until Tuesday evening. 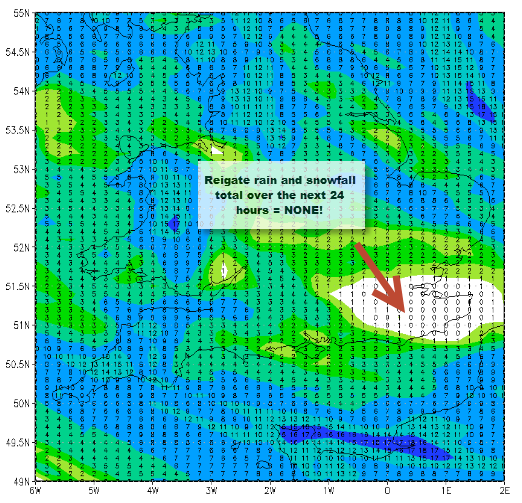 LOOK at Reigate and the South East: we are the ONLY place in the country to have little or no expected precipitation tomorrow! Despite one weak cold front moving over tonight and another more perky cold front moving in tomorrow evening it looks like any showers in the increasingly COLD wind will miss us or remain light and insignificant. Each front which crosses the country will bring increasingly cold air – culminating in the Arctic air reaching us on Wednesday. The RGS fieldtrip to Camber Sands tomorrow looks like escaping any significant showers tomorrow. It will, however, feel freezing in the wind.